– Dr. Padmalal asserts that the hungry water effect has had a major stake in the flood hazards in areas close to dams like Ranni. “That is because the submerged areas remain inundated till the clay settles. In places like Aluva and Perumbavoor along the banks of the Periyar, the hungry water acted more vigorously because these areas are characterised by soil covered banks compared to the rocky banks upstream.” He highlights the need to factor in the hungry water effect while developing flood control strategies. This, he feels, is more relevant for a State like Kerala with many hydel and irrigation dams in higher elevations. -India has no record of the status of sand sources in a district, says the Ministry of Environment report. No data, too, on the demand or consumption of sand in India (although going by the spiralling rise of cement use in the last 20 years — from 1.37 billion tonnes in 1994 to 4.8 billion tonnes in 2016, one can make a guess). There is no estimate of permissible volume that can be extracted from a river, upstream or downstream, or height of a riverbed below which mining cannot occur; no bar on harmful extraction methods, depth of mining or minimising harmful effects; no long-term monitoring programme or annual status reports; no mandate on reclamation of river banks and beds. And, more than anything, there is no effort to move towards sand substitutes: quarry dust, incinerator ash, desert sand, manufactured sand, waste from steel industry and thermal power plants etc. National NGT junks govt order easing mining rules The Green Tribunal has overruled the Union environment ministry’s three 2016 notifications that exempted mining of minor minerals like sand in up to 25 ha area from prior public consultation and the environmental impact assessment (EIA). The bench noted that the ministry’s notifications were in conflict with the 2016 sustainable sand mining guidelines, which said an EIA should address the environmental impacts of minor mineral mining. The ministry had amended the 2006 EIA notification and put mining of minor minerals in an area up to 25 ha in B-2 category. An environmental clearance is required under the category. But it is exempted from public hearings and EIA. The notification bypassed any detailed environmental study and only asked for basic project information. A district environment impact assessment authority was granted powers for environmental clearance for mines spread over an area up to 25 ha. Petitioner Vikrant Tongad had contended that the district level assessment authority had no scientific expertise in assessing environmental impacts. He had alleged that the 2016 notification provided an exemption of the “rigours of the necessity of EIA and EMP” for areas ranging from 5 to 25 hectares which previous notifications made necessary. NGT directed public hearings and EIA for minor mineral mines with 5 to 25 ha area. It added state environment impact assessment authority would evaluate smaller mines of up to 5 ha instead of district level body. The bench ordered the ministry to incorporate a procedure to calculate the annual rate and timeframe for replenishment after mining is stopped in an area and frame guidelines for calculation of the cost of restitution of damage caused to mined out areas. NGT has also prohibited any permission for mining of sand and minerals at the district level. Instead all such permissions will now have to be procured from the state govt directly. In its order the tribunal has taken back the rights of District Level Environment Impact Assessment Society (DEIAA) in granting permission for any kind of mining activity in a land area ranging from 0-5 hectares. Punjab Govt considers auctioning sand mines in clusters Ignoring Local Bodies Minister Navjot Singh Sidhu’s suggestion of setting up a corporation to sell sand, the Punjab govt is preparing to auction mines in clusters, instead of separate mines. By auctioning mines in clusters, the Department of Mines hopes to sell sand at Rs 1,800 to Rs 2,000 per tractor-trolley to the end consumer, earn Rs 300 crore for the state exchequer and check illegal mining. Sources said that under the new policy, rivers would be divided in clusters. The large chunk of areas, having mineable sand, would be auctioned. The standing committee of NBWL chaired by environment minister Harsh Vardhan, in its 50th meeting on Sept. 7 decided that additional environmental studies, which would take 3-4 years, should be sanctioned even as the construction of dam on the river could begin. Experts fear that the project would completely alter the habitat of river water dolphins in Lohit district. Arunachal Pradesh Extension of Heo and Tato-I HEP’s Techno-Economic Clearance Press release by Velcan, the owners of the 2 hydropower projects: The Central Electricity Authority (CEA), has extended the Techno-Economic Clearances (TEC) it had issued on 28thJuly 2015 to the Heo Hydroelectric Project (240 MW) and on 28th October 2015 to Tato-1 Hydroelectric Project (186 MW). After having re-assessed the progress and the situation of the projects, and after receiving a non-objection from the State Govt. Nagaland Doyang HEP landowners place set of demands Citing various grievances, the 17 Land Affected Village under the aegis of Land Owners’ Union, Doyang Hydro Electric Project (DHEP), NEEPCO Ltd., Doyang Wokha has made a series of demands ranging from employment, education, roads, buildings, healthcare, and playground at the DHEP area. – “When Wolfgang Schwanghart went to Nepal for the first time, he was shocked to see many hydropower dams perching on the steep Himalayan terrains. “They looked rather precarious,” says the geologist, who works at the University of Potsdam in Germany. According to the study, nearly one fourth of existing, currently constructed and planned hydropower projects along Himalayan rivers have high probabilities of moderate to severe damage during future earthquake. Nepal lost at least 20% of its hydropower capacity in the 2015 earthquake, which killed nearly 9,000 people and damaged more than 31 hydropower projects. The debate on hydro-electric development in the Himalayan region has seen a lot of back and forth. The supporters of hydro-electric projects argue that most Himalayan states – and countries – are underdeveloped, hence dams would bring cheap power and revenue. Their detractors, however, point to the fragility of the Himalayas since these are fairly young mountains. Op-Ed Small HEPs are not the answer to clean energy woes Shikha Lakhanpal raises valid concerns over SHPs on World Rivers Day: As rivers are traded for clean energy and vanish under the cascading impacts of small hydropower projects, there is a need to examine these projects in greater detail. The need of the hour is to regulate and formulate processes for addressing the environmental and social consequences of SHPs. Polavaram Dam Completion by 2019 appear improbable: CAG In its audit report on the Economic Sector for the year-ended March 2017, tabled in the state Legislative Assembly Wednesday, the CAG noted that progress of execution of Polavaram project had been slow, mainly due to “improper planning, delays in finalisation of designs, land acquisition, rehabilitation and resettlement… As a result, the possibility of completion of the project and achievement of intended objectives by the target date of 2019 appear improbable. Madhya Pradesh Discussion on Dams Taking the recent Kerala floods and the tragedy of Uttarakhand into major focus, experts said that dams are not as useful as portrayed by Govt. “Even the villages don’t get water on time. It’s clear they have turned water towards the companies. It would be a win –win situation if the Govt. let’s the river Narmada flow freely and not constraint it,” said activist, Medha Patkar. Slowly and steadily, irrigation projects from being farmer- centric have started becoming contractor- centric. Politicians have realised these can become milking cows for their election funding. The interests of contractors rather than that of farmers started dictating the projects that were taken up and the flow of funds to projects. A rigorous cost benefit analysis done to prioritise the project in terms of taking up and funding was given a go- by and taking up of the project is done in an arbitrary manner focusing on those projects which would facilitate maximum kickbacks. Since outlays for major projects are huge and facilitate centralised corruption, focus has shifted to major projects compared to minor projects where the outlays are going to be small and dispersed. Simultaneously the most pliable officers are posted in the irrigation sector to facilitate skimming of the projects by a strong nexus of bureaucrats, politicians and contractors. There is already sunk investment of 50,000 crores in Andhra Pradesh irrigation projects which have not seen the light of the day in terms of completion as per 2016-17 CAG report. There are talks of taking Godavari water to Krishna and from there to Penna river via Buckingham canal and lifting it up to reach higher levels. Nobody talks of the cost or time frame and the relevance of the project. Engineers who know the truth prefer to keep silent in meetings. Himachal Pradesh Gates of dams opened The gates of almost all the dams and reservoirs in various hydro-power projects in the state have been opened as they almost inched close to the danger level. With there being no let up in the incessant rains, gates of most dams – Chamera –I, II, III, Baira Siul, Kol, Nangal, Baspa, Shongtong and Larji were opened for flushing. The highest discharge of 11,729.76 cusecs was from Karcham hydro-project followed by 10306.93 cusecs from Shongtong project, both in the Kinnuar in the Satluj basin. Locals residing in the downstream areas were warned against venturing close to the riverside. The water level in the Pong Dam on Sept. 24 touched 1,385.55 feet, almost close to the danger mark of 1,390 feet. But the Bhakra dam that lies on the Sutlej has not been much affected. Water at the Bhakra rose by about 4 feet in the past two days to 1,654.84 feet, well below the maximum level of 1,680 feet. Inflow at Pong was 7,910 cusecs on Sept 22, which jumped to 1,66,559 cusecs by Sept. 25 morning. The outflow came down from 11,507 cusecs on Sept. 22 to just 810 cusecs on Sept. 25 morning. The storage at Pong increased by about 9 per cent in the past two days, Bhakra saw an increase of 3 per cent. The storage in both the dams was below normal till last week, which had been a cause for concern. The inflow at Pong dam touched 1.10 lakh cusecs in the past two days, which by itself is not alarming as per the officials. The high volume of sediment and debris flow, however, is worrying, say BBMB officials. “Normally it is 2100 ppm, which spiked to 40,000 ppm. This could choke the reservoirs and also damage tunnels and machines in the dam,” they say. Chandigarh Sukhna Lake floodgates open after a decade The floodgates of Sukhna lake were opened on Sept. 25 after the water level in the lake crossed the danger mark of 1163 feet. The last time the floodgates were opened in a similar situation was a decade ago, in August 2008. Haryana 9 houses swept away after Kaushalya Dam floodgates opened 9 houses in Rampur Seuri labour colony at Surajpur near Amravati enclave were washed away after Haryana Irrigation department opened floodgates of Kaushalya Dam on 25 Sept. evening. Heavy rain on Sept. 23-24 led to an increase in the water level of the Kaushalya Dam which had crossed the danger mark of 478 metres. Yamuna Flood Uttrakhand As per the report, 30 people from Van Gurjar community were trapped on an island by flood waters of Yamuna at Dhalipur Dehradun. Haryana 5 Karnal villages flooded by Yamuna water The water of overflowing Yamuna river entered several villages at Indri block of Karnal district on Sept. 25 while thousands of acres of standing crop also submerged in water, adding to the woes of the farmers who were already reeling under the untimely rainfall for the past three days. People residing in the district have evacuated their houses as the district administration has sounded alert following sudden rise in the water flow of Yamuna due to widespread rainfall in the hills and northern parts of the state. The state govt put the officers on high alert following release of 2.53 lakh cusecs of water was following from the Hatnikund Barrage in Yamunanagar district at 12 pm on Sept. 24. 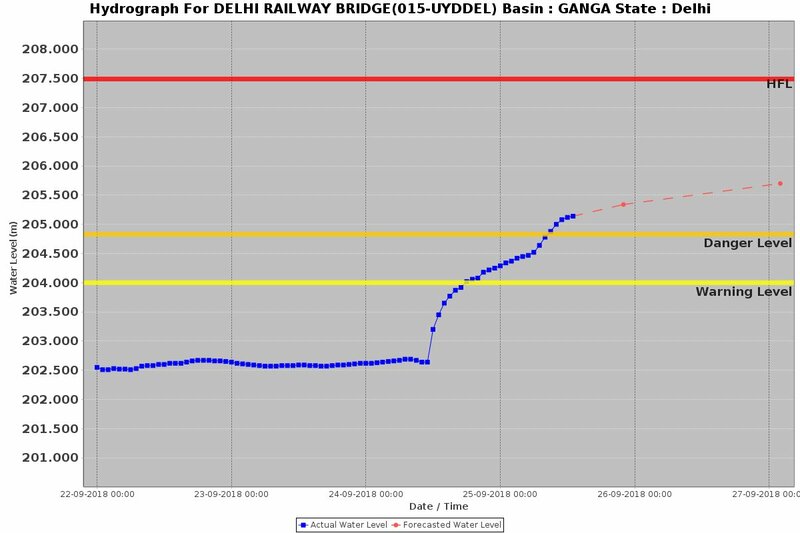 The water reached to Delhi in next 72 hours (Sept. 27). Heavy rains and cloudbursts in parts of Jammu and Kashmir, Himachal Pradesh, Punjab and Haryana killed 25 people, triggered flash floods and landslides that blocked highways and damaged houses and crops, said officials on Sept. 24. In Jammu, five members of a family were buried alive after a major landslide hit their mud shelter in the Gandoh area of Doda district. The landslide was triggered by overnight rains on Sunday in Bhatoli, 18 km from the tehsil headquarters. 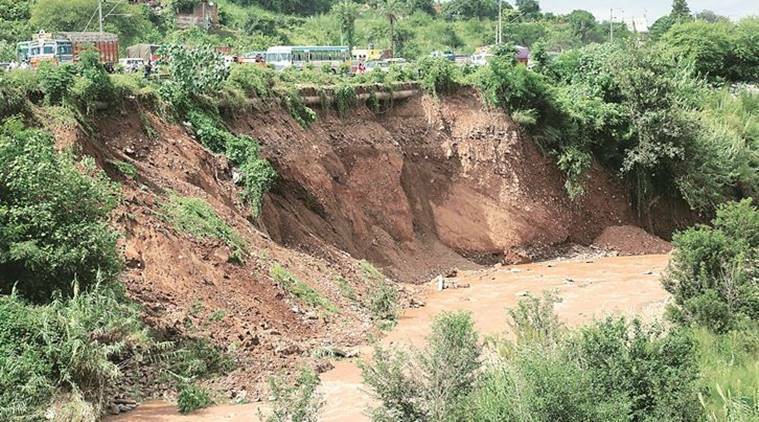 With a 40-m stretch of the Parwanoo-Solan road of National Highway NH-22 caving in near Datiyar following heavy rain on Monday afternoon, questions are being raised on the quality of construction material being used in the fourlaning work. Cracks had appeared on the road in the day and the GR Infraprojects staff, executing the four-laning work, had to make a hasty exit from the spot when the road started caving in. 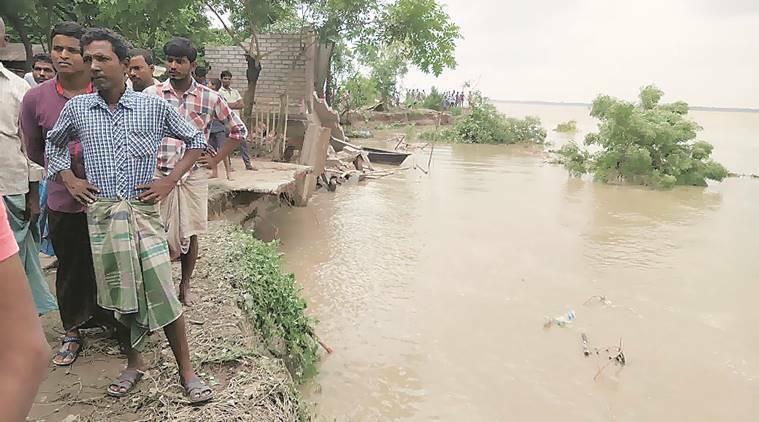 West Bengal 500 homeless as Ganga swallows land, villagers hold Farakka Barrage Authority responsible Nearly 500 people have become homeless in the Hossainpur area of Murshidabad district due to severe river bank erosion by the Ganga. The situation has generated severe discontent among the locals against the district administration and the Farakka Barrage Project authorities. Locals alleged that the project authorities “ignored” their warnings regarding the erosion. Denying the allegation, an official of the Anti Erosion Division of the Farakka Barrage Project said that “adequate preventive measures” have been taken to check the erosion and the situation was now under control. He claimed that a section of the villagers hurled abuses at a team of Farakka Barrage Project officials when they went to the spot on Sept. 22 to strengthen the river bank. Wobaidur Rahaman, an affected resident, said erosion of the river bank was a long-term phenomenon that had not been addressed in a timely manner. Asif Iqbal, secretary of the Ganga Bhangan Pratirodh Committee, told that he had submitted a memorandum to the general manager of the Farakka Barrage project authorities last month, urging the central govt body to initiate repairs. “However, we got no positive response from the general manager. Only sacks were placed on banks instead of boulders. The area falls under its jurisdiction, yet it is showing apathy… We now demand that the banks must be repaired in an appropriate manner or else we will be forced to start an agitation outside its office from Sept. 26,” he said. Murshidabad District Magistrate P Ulaganathan said the administration has urged project authorities to address the issue. “It is a very difficult body to work with. They have their own system of functioning. We have done our bit and instructed the PWD and irrigation department to initiate work. But as they are the custodians of that area, they must conduct proper repair work of the banks,” he told The Indian Express. Kerala Sholayar dam shutters opened, flood alert issued As the frequent rain continues in the Sholayar forest region, the four shutters of Sholayar dam was opened on Sept. 23. According to an official at the dam,”the water level of the dam reached 2661 meter and the water inflow to the dam continues. Since the maximum water level is 2663 feet, the excess water has been released. Maharashtra Mutha canal’s morning breach saves Pune from major disaster Nearly 350 low-income and slum tenements of Janata Vasahat were inundated with water on Sept. 25 morning after the Mutha right bank canal wall suffered a breach at around 10.30 am causing minor floods in the Dandekar bridge area. The incident took places around Dandekar bridge Janata vasahat, leaving hundreds of houses nearby inundated. Water was flowing at the rate of over 1400 cusecs at the time of the incident, but the irrigation department immediately stopped further release of water in the canal from the Khadakwasla dam. Flooding in the country’s cities is due to poor planning and a wilful neglect of urban ecosystems. Besides inconvenience caused to citizens, it has serious economic dimensions. Poor urban planning can cause a country to lose as much as 3% of its GDP every year, according to a report by the United Nations Environment Programme. Karnataka Drains overflow, flood homes in many parts of Bengaluru The heavy rains that lashed the city late on Sept. 23 night and in the wee hours of Sept. 24 wreaked havoc, causing drains to overflow and flood homes. This was the first major flood in the city, with the monsoon having been relatively weak so far. Heavy rain through Sunday night across Bengaluru sent 9 lakes overflowing, flooding houses and apartment basements in their neighbourhood. The rain was most intense in southwestern parts of the city. IMD Monsoon rainfall this year 9% short of normal The season ended on Sept. 30 at a rain deficit of 9.4%, making the national weather agency’s forecast off by more than the 4% margin of error. The department had forecast good rainfall over northwest India at 100% of LPA. The region saw its best monsoon in five years which ended at 98% of LPA. Likewise, its forecasts for central India (99% versus actual of 94%) and south peninsula (95% versus 99%) were well within the 8% error margin. East and northeast India, however, performed below expectations with just 75% rainfall during the season as against a forecast of 93%. In its first two forecasts (in April and May), IMD had said the monsoon was likely to be 97% of LPA. In an update for the second half of the season (August-September) released on August 3, IMD had forecast 95% rainfall for the two months. The actual rainfall during the period was close to 87%. September itself ended with a massive shortfall of more than 23% and was the driest monsoon for the month since 2015. In contrast, private forecaster Skymet had forecast poor rainfall in August (88%) and a slightly better performance in September (93%). The opposite turned out to be true, with August rainfall being slightly less than 93% of LPA. In the event, fairly good rainfall distribution, despite the overall shortfall, kept the rain deficiency down to 12 subdivisions of the country out of 36 (33% of total). The deficiency was higher if one looked at the districts with 38% of districts for which IMD had data (252 out of 659) showing deficient or large deficient rainfall. Late Sept. rain combination of 3 factors In a reminder of 2013 when a cloudburst in Uttarakhand due to more than one weather systems caused devastating floods and landslides in the state, meteorologists see similar features in the “unusual” weather events unfolding over Himachal Pradesh and adjoining plains in Punjab and Haryana over the past two days. A “rare” combination of three weather systems led to havoc in the hill state and adjoining regions over the weekend, causing widespread damage to property and crops, says weather expert Mahesh Palawat. One, the presence of a strong western disturbance (WD), which itself is “unusual” given that they usually descend to lower latitudes around October. Two, the presence of a well-marked low pressure area, a remnant of cyclone days; and three, a trough extending between the two. Palawat says the combination of the three systems (low pressure area in the Bay of Bengal and Arabian Sea and a strong WD) that led to the 2013 Kedarnath episode. What is worrying is the increasing frequency of WDs over north India over the years, especially during the period they are confined to upper latitudes, due to climate change. As many as 40 WDs coincided with the June-Sept monsoon. Normally, WDs affect the Indian subcontinent from Oct. to March. Between April and Sept., they usually travel in upper latitudes, affecting countries like China and Russia, says Palawat. Gujarat Half of state dry even after water release from Narmada Amazing new revelation how the drought prone districts of Gujarat are not getting Narmada water due to theft of water in the upstream. – It was a disappointing and embarrassing moment for chief minister Vijay Rupani at a cabinet meeting held on Wednesday when his govt showed inefficiency in acting against water theft from Narmada canals across the state. It has been 10 days since the state govt started releasing water for irrigation through Narmada canals, but half of Gujarat remains dry owing to the water theft menace. Meanwhile, the govt has declared 6 more talukas as drought hit. The decision to add six more talukas in the category of “scarcity-hit” was taken here on Sept. 27 during the first meeting of a sub-committee of ministers formed to review availability of water in the state in the wake of deficient rainfall. “There 16 talukas have received less than 125 mm rainfall this monsoon. They include the entire Kutch district, consisting of 10 talukas, four talukas of Banaskantha — which include Tharad, Vav and Kankrej —Chanasma taluka in Patan and Mandal taluka in Ahmedabad district. Despite this, the water from the Narmada river will be routed to the lake surrounding the prestigious Statue of Unity to ensure it is picture-perfect on the day of its inauguration. PM Modi will inaugurate the project that includes an exhibition gallery and research centre, besides the statue on Sardar Patel’s birth anniversary. A total of 84 million cubic metres (MCM) of water is needed to the fill the lake, of which 6 MCM is already present. Sources say before inauguration, the govt will release an additional 78 MCMs of water. It is worth to mention that during the Gujarat polls, the river’s waters were used to fill the Sabarmati riverfront in Ahmedabad so that Prime Minister Narendra Modi’s seaplane could land. The state will release water from the Sardar Sarovar Dam on Oct. 31 to fill the artificial lake surrounding the SOU. Maharashtra Water stock of 4 dams down by 1 TMC in 15 days over poor rainfall The collective storage of the 4 dams in the Khadakwasla circle has plummeted by 1 TMC because of scanty rainfall in September. The present stock of the dams is 26.82 TMC, down from 27.87 TMC earlier this month. None of them recorded increase in water-level in the past 15 days. CAUVERY Op-Ed Saving Cauvery’s cradle by Bopaiah Biddanda Professor of Water Resources at the Robert B. Annis Water Resources Institute, U.S. Projects that are being contemplated, such as the laying of multiple railway tracks in the critical Cauvery river basin in Kodagu district, Karnataka, are not only economically unviable but also ecologically damaging. Mega projects pose a clear threat to the long-term water security of the three States that depend on the Cauvery (Karnataka, Kerala and Tamil Nadu), and exacerbate the threat posed by seasonal droughts and floods. “A forest­depleted Kodagu basin will have reduced capacity to capture and store rainwater.” It is a picture of destruction in Hattihole near Somwarpet, Kodagu, after the floods. | Photo Credit: Sampath Kumar G.P. The Cauvery basin drains an area of about 81,000 sq. km. Originating in Talakaveri, Kodagu, the river irrigates agricultural fields, generates electricity, and provides drinking water to downstream communities across south India. The Cauvery and its tributaries contribute the bulk of water to the Krishna Raja Sagara dam near Mysuru, the primary water source for Bengaluru. Importance of rivers in Western Ghats The recent floods in Kodagu and Kerala are to be treated as a warning bell for pursuing any alterations to the ecology of the Western Ghats, and rivers in particular. Understanding the river hydrology and floodplains, which form diverse habitats for flora and fauna, can go a long way in arriving at sustainable solutions. Time and again, ecologists have raised concerns against river linking and the threats it can cause to larger ecosystems. The Union environment ministry will be soon issuing a draft notification declaring the Western Ghats as eco-sensitive area (ESA) for a second time after a similar draft in 2014 expired due to a lack of consensus among states and the Centre. Karnataka, one of the six states to be affected, has already said it will not accept the fresh notification as “it will have an adverse effect on state’s economy”. Kerala Rivers in state detect increase in cyanobacteria after floods A rising level of contamination is reported in the water bodies across the state after floods, reports the Centre for Water Resources Development and Management. The degree of contamination in the southern rivers of the state has crossed more than 75 percent. The contamination is mainly caused due to septic tank waste released into the water bodies. Due to this, the color of water turned green and it stinks badly. Cyanobacteria produces toxins like cyanotoxins. The water contaminated by cyanobacteria causes neuralgia and kills the fish in the water bodies. Before floods, 29 out of 44 rivers in the state were found contaminated. The presence of cyanobacteria increased in Chalakkudi river, Meenachilar and Achankovil after floods. The centre for water resources development suggests that the State Pollution Control Board should regulate the waste water disposition into water resources. GANGA Documentary Trailer Saviour To Seeker The Story of Mother Ganga The first trailer of “Saviour To Seeker- The story of Mother Ganga”, the first documentary film on Ganga which will delve deep into its spellbinding journey from religious, historical, geographical, biological, to a detailed analysis of its slow death. The film will be under Immaculate Films Pvt Ltd and Dolly Verma. Govt is implementing 115 STP projects in Uttarakhand, Uttar Pradesh, Bihar, Jharkhand, West Bengal, Haryana and Delhi at a cost of Rs 17,876.69 crore. 115 projects for sewage infrastructure are part of 240 projects for overall development of the river. Of these, 27 completed and work in 42 is in progress while 7 projects allotted. Total projects a maximum 31 are in Uttarakhand, followed by 32 in Uttar Pradesh, 20 in Bihar, 16 in West Bengal, 12 in Delhi and 2 each in Jharkhand and Haryana. A review of the 84 old STPs revealed that 39 are working but the rest need upgradation and upgradation work was on in 14 projects while 12 have been sanctioned for the same. Have created capacity to treat 1,700 MLD sewage. The cities located by the side of the river produce 2,950 MLD sewage and if steps to purify the water were not taken this in another 15 years will reach 3,600 MLD. 97 cities, which were polluting the river with 10 including Haridwar, Kanpur, Allhabad, Varanasi, Patna, Bhagalpur and Kolkata contributing 65 per cent of the pollution in the river. Varanasi Turtle Sanctuary In Modi’s Constituency, a Wildlife Sanctuary is Quietly Being Erased The ‘Kachhua’ or Turtle Wildlife Sanctuary (TWS), the world’s only protected area dedicated to freshwater turtles, is now set to be wiped off the conservation map of India. The state govt has submitted a proposal to the Govt of India asking for the Kachhua sanctuary in Varanasi to be ‘denotified’ following a meeting of the State Board of Wildlife of Uttar Pradesh on August 30, 2018. Documents available with The Wire reveal how grounds are being prepared by Yogi Adityanath’s govt to denotify the 210-hectare area of the sanctuary. The reason stated by the DFO Kashi wildlife division in a written submission to the National Board for Wildlife states that “sence (sic) the sanctuary is not fulfilling its purpose hence it being denotified”. Another letter, by chief conservator of forests S.K. Awasthi on September 5, 2018, asks the DFO Kashi wildlife division to submit a proposal for denotification of the ‘Kachhua Wildlife Sanctuary’ since the State Board of Wildlife has cleared this in a meeting held on August 30,2018. If the Centre approves the proposal to denotify the Kachhua Sanctuary in Varanasi, this will be the first protected area to be completely wiped off the map of India since the introduction of the Wildlife Protection Act, 1972. Is the World Bank group above the law? A fishing community in India challenges the bank’s private-lending arm in the US Supreme Court. The US Supreme Court sits more than 12,000 miles from Tragadi Bandar, the patch of India’s west coast where Budha Ismail Jam has spent most of the past two decades fishing for a living. Jam’s seasonal home, a single room with burlap walls and no electricity or running water, is beyond the Court’s usual reach. 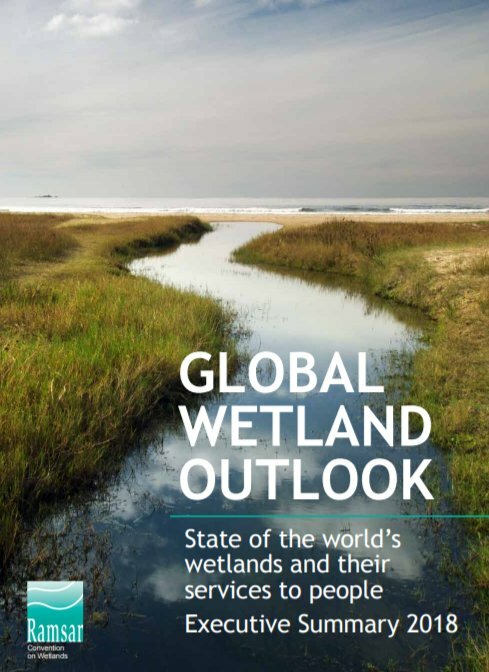 – The 88-page report found that around 35% of wetlands — which include lakes, rivers, marshes and peatlands, as well as coastal and marine areas like lagoons, mangroves and coral reefs — were lost between 1970 and 2015 at an alarming speed amid urbanisation and agriculture shifts calling for urgent action to halt the erosion. – Today, wetlands cover more than 12 million sqkm, the report said, warning that the annual rates of loss had accelerated since 2000. – Directly or indirectly, they provide almost all of the world’s consumption of freshwater and more than 40% of all species live and breed in wetlands. – The Ramsar Convention has been ratified by most of the world’s nations, including the U.S., China and India, and has designated more than 2,300 sites of international importance. Karnataka Bellandur lake frothing again Bengaluru’s Bellandur lake, infamous for its pollution, spewed froth and foam on to the busy roads surrounding it on Sept. 25 after overnight rain. The toxic froth in Bellandur and the other lakes of Bengaluru has persisted for at least two decades and has become a regular phenomenon of sorts whenever it rains heavily. Three others lakes – Yemalur, Varthur and Byramangala lake – also saw heavy frothing recently. In July, the sewage-filled froth of Bellandur lake travelled all the way to neighbouring Kolar district and reached a 1,400-crore water project. In February 2017, huge flames were seen leaping off Bellandur lake, covering the region in thick smoke. The fire recurred in January 2018, and around 5,000 army personnel had to be deployed. They managed to put out the flames only after a seven-hour battle. Bellandur is one of the largest of the 262 lakes in Bengaluru. Ithas become infamous for the gigantic clouds of froth that accumulate on its surface, spilling over into the many busy roads that skirt its shores several times a year. MoEF 5 yr action plan to remain a paradise of migratory birds MoEF has come out with a 5 yr national action plan to conserve habitats of migratory bird species. The action plan spanning 2018-23, brought out by the MoEF is meant for coordinated actions among states for securing and enhancing population of migratory birds in India within their range across the Central Asian Flyway (CAF). The move may help India protect its several wetlands and other natural habitats. Chilika lake, Odisha, Sundarban National Park, West Bengal; Eagle nest Wildlife Sanctuary, Arunachal Pradesh; nal Sarovar Bird Sanctuary, Gujarat; Kumarakom Bird Sanctuary, Kerala; Pulicat Lagoon, Andhra Pradesh and Tamil Nadu are among several other favourite destinations of migratory birds in India. Karnataka Farmers using sewage to make saris India is one of the biggest users of groundwater in the world, extracting more than the USA and China combined. But as the population grows, supplies are becoming scarce in some areas, like rural Bangalore. Karnataka Govt denies releasing untreated water in KC Valley project In its submission to the Karnataka High Court, the state govt said that the quality of treated water supplied as part of the Koramangala-Challaghatta (KC) Valley Project meets the surface water norms prescribed under the Environment (Protection) Rules of 1986. A division bench of the HC headed by Chief Justice Dinesh Maheshwari was hearing a PIL over the issue, filed by activist Anjaneya Reddy of the Shashwatha Neeravari Horata Samiti from Chikkaballapur. In the petition, Anjaneya argued that the project was taken up without conducting a scientific study, and that the treated water supplied via the project contained industrial effluents. The KC Valley Project was inaugurated on June 7. It provides treated water from STPs in Bellandur to 126 irrigation tanks in Kolar and Chikkaballapur. The project was initiated as a way to solve the water woes of typically dry districts by recharging groundwater levels and making water available for irrigation. But ever since the project was launched, activists have repeatedly questioned the quality of water transported through the project. BWSSB going to pump more frothy water into 128 lakes? As per the report, the BWSSB has said that it will start pumping the allegedly treated water in the KC Valley STP to 128 lakes in the Kolar and Chikkaballapura catchment areas, in the next 15 days. In 2017, the Japan International Cooperation Agency (JICA) had conducted a feasibility study for the BWSSB’s proposed projects to provide Cauvery water and sewage connections to the 110 villages within the BBMP limits. Nepal Govt Revives $2.5 Billion Hydro Power Plant Project Deal With China PM KP Oli’s govt has reportedly decided to hand over the Budhi Gandaki Hydropower Project a $2.5 billion to the China Gezhouba Group Corporation (CGGC), reversing the former Sher Bahadur Deuba government’s decision to develop the 1200 MW project with internal resources. Laos Dam Disaster South Korean CSOs want Govt, Company to be accountable for Lao Dam Disaster South Korean civil society organizations called for their govt and the main partner in a joint venture to take responsibility for the deadly breach of an auxiliary dam at the South Korean-backed Xe Pian Xe Namnoy hydropower project in Laos, which left at least 40 people dead and displaced thousands of others. – The dam collapse on July 23 caused devastating floods that swept through Champasak and Attapeu provinces in southern Laos, displacing about 7,000 people, most of whom have been living in five temporary camps after losing their homes and possessions. Report River deltas at risk The Ganges River delta in Bangladesh and India and the Mekong River delta in Vietnam and Cambodia are prime examples of tropical deltas at risk. 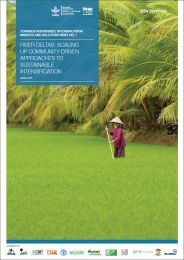 Here is the PDF copy of the report: River Deltas; Scaling up Community-driven approaches to sustainable intensification. America Taming mighty Mississippi FANTASTIC: Earlier this year about MISSISSIPPI River, thought provoking, thanks, Nikhil Desai for sharing. – Barges pay nothing to go through locks now. No one does. The locks are run in the public interest. Balkan ‘Horror List’ of dams threaten some of the world’s last wild rivers Local people in Balkan South Eastern Europe protesting to save their free flowing rivers from hundreds of proposed dams: New dam construction in the Balkans has rocketed by 300 percent between 2015 and 2017, and the European Union now looks set to approve millions of dollars of funding for 38 large-scale dams in what campaigners say is a hydropower “horror list” that will spearhead the expansion of a further 2,800 dams across the Balkans. 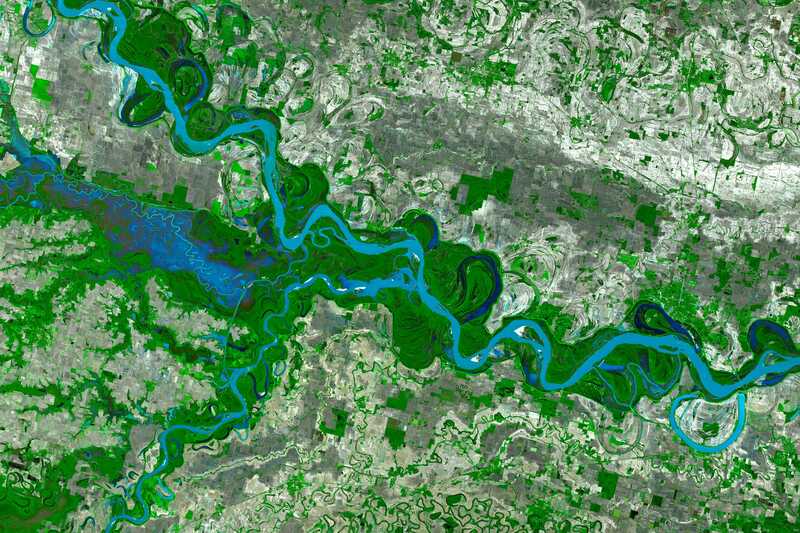 Global Satellite images of rivers reveal humanity’s abusive relationship with the world’s most precious resource AMAZING SATELLITE IMAGES OF RIVERS: Here are some of the most telling satellite images of rivers (which we sourced primarily from NASA Earth Observatory) and what they reveal about our close and often contentious relationship with vital waterways. 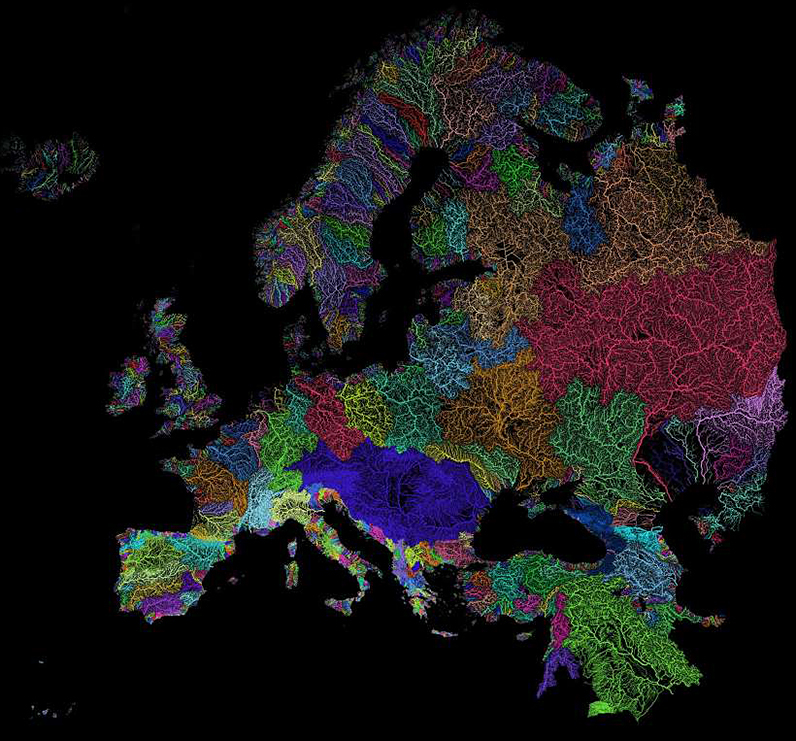 Also see, stunning maps, via geographer Szűcs Róbert, divide planet’s watersheds into colorful catchment areas, and provide an informative look at how water flows across continents. Nothing is more fundamental to life than water – and this is particularly evident in a country like Egypt, which has been aptly described by Greek historian Herodotus as the “Gift of the Nile”. In Egypt, an astonishing 95% of the population lives alongside the mighty Nile, which is the world’s longest river at 4,258 mi (6,853 km) and also the only major source of freshwater in an otherwise arid desert landscape. Global Beach Sand Mining Who stole the beach? Beaches are the target for organised gangs all over the world. The building boom in countries like China and India and worldwide demand for consumer goods containing sand minerals has enriched criminals who specialise in stealing beaches. These gangs have become known as ‘sand mafias’ and their impact, if understood globally, is massive. Illegal sand mining is bigger than all other environmental crimes combined. Study Climate change affecting Himalayas biota A new study by WII has revealed that the upper reaches of the Himalayas are warming, something that will put local flora and fauna at tremendous risk. The study was begun in 2016 and was conducted in the basin of the Bhagirathi river near Gaumukh in Uttarakhand. The study region is located at an altitude between 3500-4500 metres. At 4,500 metres, the maximum temperature touches 5 degrees Celsius, while the minimum plunges to -14. At 3,500 metres, the maximum temperature is 10 degrees Celsius, while the minimum is around -2.5 degrees Celsius. The study has revealed that there has been a rise of at least 0.5 degrees Celsius in the temperature of the area, accompanied by an almost 10 per cent variation in humidity levels. 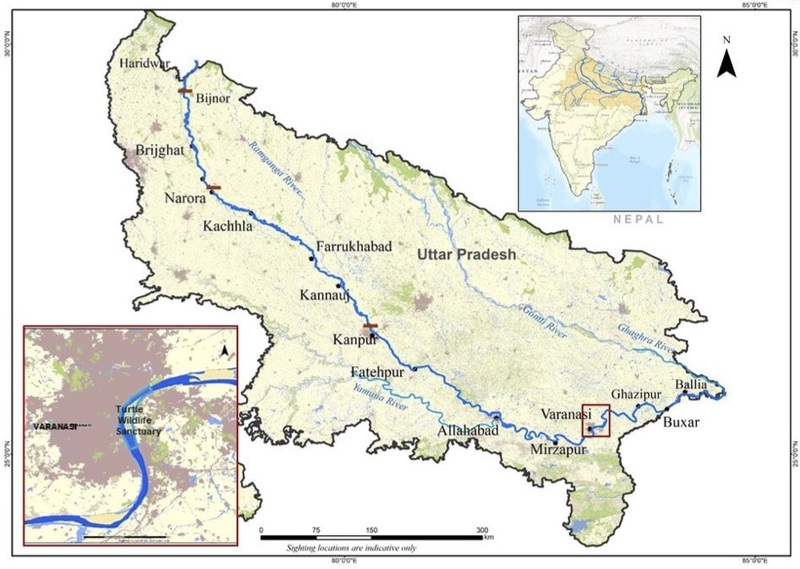 Study Managing climate-induced flood risk in Himachal Pradesh A pilot study has identified hotspots in the state that are likely to be most affected by cloudbursts and monsoon downpours; this can help reduce risk from such disasters. US, China, India Top carbon emitters to face the biggest economic losses India to pay HIGHEST cost in the WORLD, of climate change in terms Cost per tonne of CO2 emissions. – India’s country-level social cost of carbon emission was estimated to be the highest at $86 per tonne of CO2. It means the Indian economy will lose $86 by emitting each additional tonne of CO2. India is followed by the US, where the economic damages would be $48 per tonne of CO2 emission. Saudi Arabia is close behind at $47 per tonne of CO2 emission. Karnataka Farmers turn to millets as a climate-smart crop Farmers in arid parts of state have adapted to climate change by switching from water-intensive rice, sugarcane and maize cultivation to various types of drought-resistant millets. 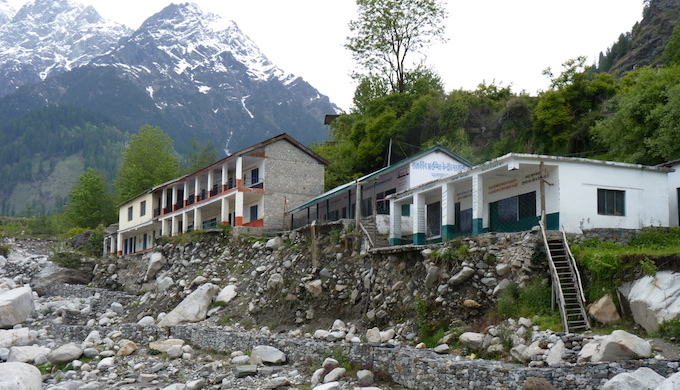 Jammu & Kashmir Melting Glaciers, 800 Hotels, Overflowing Garbage? A recent study conducted by S. N. Mishra, a researcher form Indian Air Force, found that there is a drastic decline in precipitation during the winter, mainly due to the evident climate change. That’s nearly 70% precipitation that the entire region. Another study done by Ladakh Ecological Development and Environmental Group shows that locals use an average of 20 litres of water per day compared to 75 litres by tourists. Darjeeling Himalayas gets a people-centric early warning system for landslides A community driven early warning system for landslides has been put in place by the Geological Survey of India in the Darjeeling Himalayas. In a bottom-up approach, the system relies on rainfall threshold measurement by members of the local community that is then shared with the administration for timely action. It is backed by a body of long-term research by GSI on rainfall threshold, landslide vulnerability mapping and on surface deformation using a radar-based technique. Information from a pre-trained set of volunteers can easily be combined with data extracted from social media for disaster relief. National Fast-tracked wildlife clearances threaten last wild areas, water sources & hasten Climate Change EXCELLENT REPORT: The rate of clearances granted by the SC-NBWL has accelerated sharply under the Modi government, which views such checks and balances as “speed breakers and roadblocks to development”, as the Indian Express quoted the then environment minister, Prakash Javadekar, as saying in July 2014. No more than 1.1% projects were rejected, on average, annually between June 2014 and May 2018, dropping from 11.9% under the previous UPA govt between 2009 and 2013, according to a recent analysis by the Delhi-based advocacy, Centre for Science & Environment. This works out to 130 proposals recommended, on average, every year–more than double the 52 during the second tenure of the second UPA govt (UPA-II). – The environment ministry lists its high rate of approving projects among its ‘achievements’. A document uploaded on the website of the Ministry of Environment, Forest and Climate Change lists as its “initiatives and efforts” more than 400 projects approved by the NBWL between 2014 and 2017. When questioned about the damage that such a high approval rate could cause to wildlife, Soumitra Dasgupta, inspector-general of forests for wildlife, told IndiaSpend that the SC-NBWL “cleared the proposals in its wisdom”. Repeated emails to the three non-official members of the committee–H.S. Singh, director, Gujarat Ecological Education and Research Foundation, and R. Sukumar, professor at the Indian Institute of Science and well known for his work on the ecology of the Asian elephant, elicited no response. 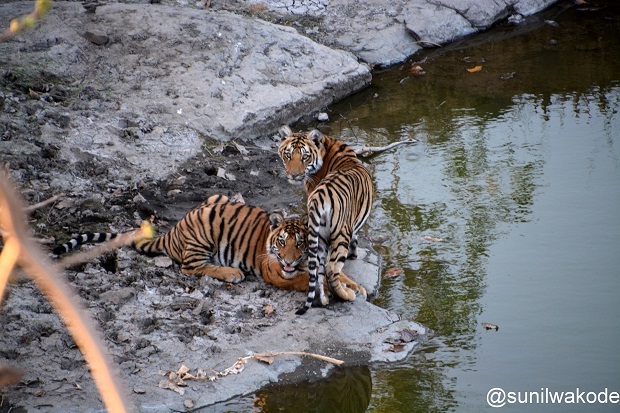 – Another decision widely criticised was the clearance given to the Ken-Betwa river linking project inside the Panna Tiger Reserve in Madhya Pradesh at its 39th meeting in August 2016. “The project if approved will lead the death of Panna Tiger Reserve,” said Sreenivas Murthy, a forest official then the field director of Panna, in a September 2014 note to the NTCA, which was accessed by IndiaSpend. The application to the CEC questioned this authority of the SC-NBWL to allow diversion of land in Panna National Park. The Wildlife Protection Act unambiguously prohibits granting permission to any activity that destroys wildlife and damages or diverts its habitat, unless it is for the improvement or better management of wildlife therein. “There is nothing in the (Ken-Betwa link) plan which remotely suggests that it is for the better management and improvement of wildlife,” noted the petition filed by the founder-editor of Sanctuary Asia, Bittu Sahgal, and retired Indian Forest Service officer Manoj Mishra. But the CEC has failed to prevent, or even question, the clearance. “The CEC application was filed in February 2017, but it is yet to give its report in spite of several reminders ,” environment lawyer Ritwick Dutta told IndiaSpend. Dutta pointed out that “to date the CEC has not opposed or objected to any decision of the SC-NBWL and has become a rubber stamp as well”. The Supreme Court has asked the to CEC submit its report by October 31, 2018. – Besides, there are no mechanisms to monitor if mitigation measures have been implemented, and how. Dasgupta admitted that monitoring compliance is a “weak link”, while Jairam Ramesh, the environment minister under UPA-II, called it a “joke” in conversations with this writer. Tushar Dash, of Vasundhara, working in the area of FRA, expressed concern over the non-compliance with FRA even in the present legal regime. “All formats for forest clearance require a certificate from the collector to ensure FRA compliance. But the FRA and the guidelines issued earlier by the Ministry in 2009 require certificates from gram sabhas on completion of forest rights recognition process and the consent of the gram sabha. These statutory requirements are being rampantly violated in the forest clearance process, resulting in violation of forest rights across the states,” he said. Chardham All Weather Road Project NGT approves the project, with caveats In its order, the bench stated that the issue for consideration before them was if there was violation or damage by the project and what safeguards are required. “Protection of environment is of primary concern under the precautionary principle and sustainable development…these are accepted principles of environment jurisprudence…no project can be carried out that endangers human health or public safety,” the bench stated.